I think this is the first time Tiny Wooden Pieces has wandered completely outside of our stated subject matter. The plan was always to focus on board games, but mix in other elements of what the kids call ‘geek culture’. And if Star Wars doesn’t happily fit that term then it’s time I hung up my keyboard. Which would mean dismantling my laptop to get at it. And slow, and often frustrating as it is, I’m not quite ready to take that step. 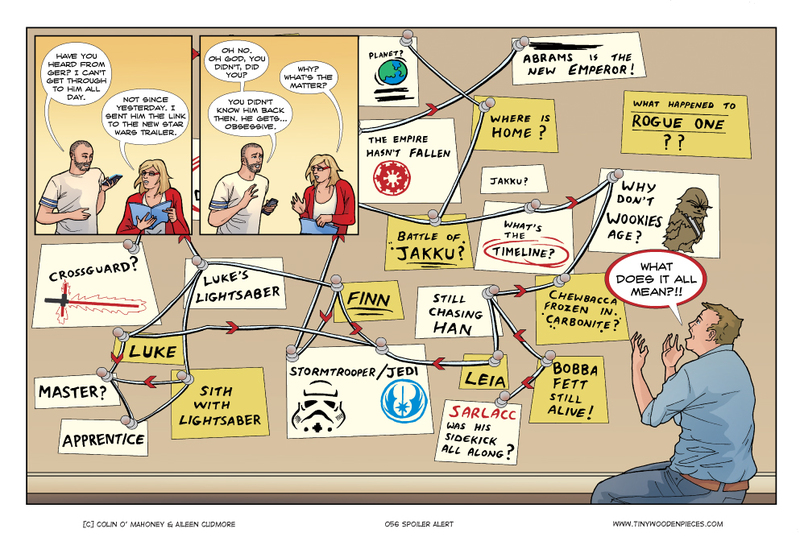 And that’s why this week’s comic is about the Star Wars trailer! (see how I tied it all together?). If you do find yourself on the site just because it’s a Star Wars comic, I’m afraid the rest of our archives are filled with cardboard, dice, counters, and the eponymous tiny wooden pieces. But board games are cool now, so if you don’t want to get laughed at by your tight-trousered, long-bearded, hipster friends you had better read our archives and familiarise yourself with Catan, Netrunner and Dead of Winter. There’s just about enough time left to say you liked board games before everyone else did. You do want to be cool, don’t you? Happily, board games are more and more popular now, which means either more people will come to board games via Star Wars-licensed board games, or there will be more Star Wars-licensed board games because there are more people coming to the hobby. I think? Either way, more Star Wars board games, and that delights me. Although I promise we will leave it at least a few weeks without doing a Star Wars comic of any kind. We’ve been discussing this recently, and we have been sci-fi heavy on the site. Obviously the comics we make come from the games we play, and we are both sci-fi fans. But Aileen has been wanting to try and diverse a bit, and I can’t argue with trying different genres and game-types. So in our game playing we will be looking to lean more towards Euro-titles with less of a focus on combat, lasers and Wookies, and more of a focus on exploring, building, heck, anything at all. The themes and game types covered by modern board games are just so diverse, it’s incredible. It almost feels like a disservice to limit ourselves to any one type. So we will be happily broadening our horizons in the future. Lost Valley comes to mind as an explore game – as you go you build the land. I guess Escape is kind of like that, but a bit more frantic. Technically Race for the Galaxy Alien Orb has this as well, though many didn’t like it. The idea intrigues me, but I can see how it could slow the game quite a bit. I don’t think I had heard of Lost Valley, I’ll check it out. Cheers, Peter. All the Star Wars game you mentioned are collectible to one extent or another, so yeah, they will end up being expensive. Nonetheless, we play X-Wing and aren’t going to be able to resist Imperial Assault for much longer. Even the core box for that is expensive, although probably the most standalone of the games, if you ignore it’s skirmish mode. That’s what I’m telling myself, anyway. Looked down my collection on BGG and realised I don’t really have any exploration games as such (discounting the aforementioned Escape). I don’t have many with multiple paths to victory, unless you count something like Mammut, which is a bit of a “points salad”, and you really need to do a bit of every path to ensure victory. Dead of Winter might fit the bill 😉 It’s currently near (if not on) the top of my wishlist – it has exploration and multiple paths to victory….. 😉 I do have a copy of Among the Stars, which isn’t really about exploration, but there are different paths to victory. I’ll check out Among the Stars. Paths to victory in Dead of Winter depend on the objectives you get at the start of the game. So while you do need to do different things to win, you don’t have a choice in it. It is a fantastic game, though. I haven’t played it yet, but for an exploration game with lots of different ways to score points, you might want to check out “The Cave” from the designer of K2. I’ve been reading a number of reviews on that one lately. They may be mixed, but it certainly seems to have its fans. I also enjoy Expedition Northwest Passage. The core is laying tiles to find a path from Greenland to the northwest passage and back again. You score points by a mix of token set collection, tile-laying, and racing to/from the NW passage. Additionally, the game is powered by a nifty little action point system depicted by little wooden sailors which you get to allocate between a ship and a sled. Each round the sun moves around the board and different areas of the sea freeze over, so careful planning is a must. Expedition Northwest Passage sounds really great! We’ll be checking that out for sure. Have heard that The Cave is not as good as K2, though. We have been trying to get our hands on K2, but it’s been out of print, or otherwise unavailable for a while. I’ll second Expedition Northwest Passage. I only picked it up last Christmas but am enjoying it, even if I haven’t successfully made it to the Northwest Passage and back yet. Just played Lost Valley for the first time on Saturday and liked that one too.